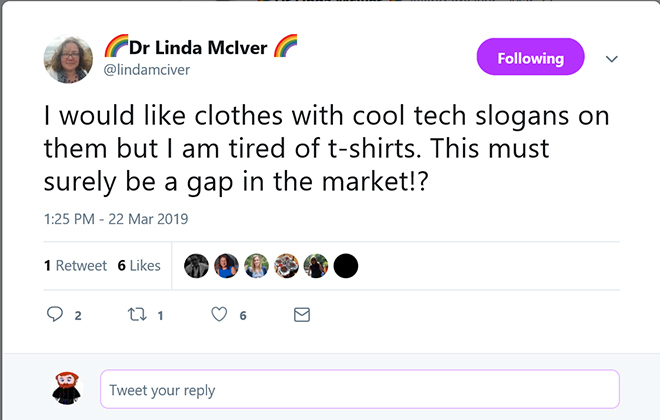 I have been following Linda McIver for a few years now. She is passionate about education and a huge advocate of STEM/STEAM in schools. How long have you been on Twitter? Nine years. I joined in 2010. Do you know, I don't even remember? I didn't use it much for a long time, but over the last few years I've ramped up my engagement to connect with people who are interested in the same things, and it's become hugely valuable to me. What 'added value' does Twitter give over other social media types? The first time Twitter really struck me as different was when I had a Twitter conversation with Nobel Prize winner Peter Doherty. It is such a democratic platform, so you can communicate directly with scientists, politicians, entertainers, and anyone. That's fairly unique in our extraordinarily stratified society. 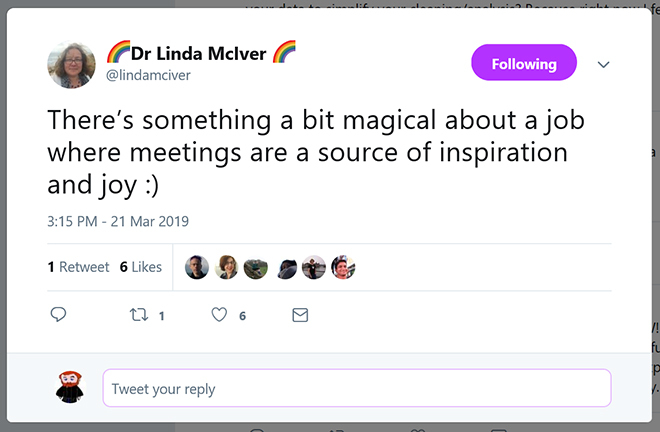 It's also great for following conferences you can't be at, if there are people live tweeting them. I love taking the parts of a talk that interest me and putting them onto Twitter in real time. I have developed a really positive Twitter community and find people are mostly really supportive and encouraging. The key is to keep it real. You don't have to tweet anything, but what you do tweet is much more valuable if it's genuine. Who do you follow that everyone else should follow as well? Twitter is only as good as your follow list. Don't feel like following is an obligation. Don't just follow back. Seek out people who have interesting things to say. Follow the people they retweet. And report and block freely when people behave badly. Hashtags like #techgirls, #STEM and #datascience. Very clever comments on life and society.